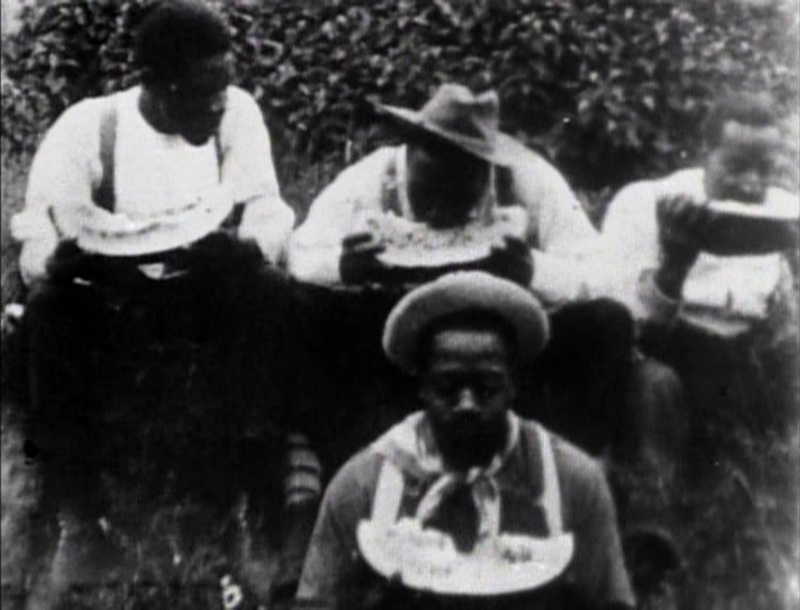 This film is either a deliberate remake of the 1896 movie “Watermelon Eating Contest” or else an unintentional return to a theme seen as “natural” in American cinema. The movie shows that little had changed, so far as the depiction of African Americans was concerned, while cinema progressed. We see a group of four men eagerly consuming watermelons and spitting out seeds. At first things are fairly orderly, although the men occasionally seem to joke or roughhouse with one another. One man finishes his slice of watermelon and reaches for another, but soon the others are fighting with him and the one man sitting in front who seems to have the largest piece. Pieces of watermelon get broken off and everyone gets messy. As with the original, this is not a film that is likely to agree with modern audiences. Today there is much stronger sensitivity, even among white people, to the degree that watermelon has become a racist trope, confirming the inferiority, innocence and dependency of black people. This movie simply confirms all of this, including the animalistic way in which the “contestants” are shown eating and fighting with one another. It’s all the more noticeable because there have been so few other depictions of African Americans up to this point. They are only brought in for movies like this, which are designed to humiliate them as individuals and as a race. This would lay the groundwork for a century of racism in the American media, which still is felt to this day.